NJCAA Player of the Year averaged 2.6 points in 27 games for the Utes. (Trent Nelson | The Salt Lake Tribune) Utah Utes guard Charles Jones Jr (1) drives on Oregon State Beavers guard Antoine Vernon (13) as Utah hosts Oregon State, NCAA basketball in Salt Lake City on Saturday Feb. 2, 2019. Charles Jones Jr. is transferring from the Utah basketball program with one year of eligibility remaining, 247Sports reported Monday. Jones’ entering the NCAA transfer portal is not a surprising move, even though the graduation of guards Sedrick Barefield and Parker Van Dyke may have created more playing time for him as a senior. Jones averaged 2.6 points as a Utah junior in 2018-19, after transferring from the College of Southern Idaho as the NJCAA Player of the Year. 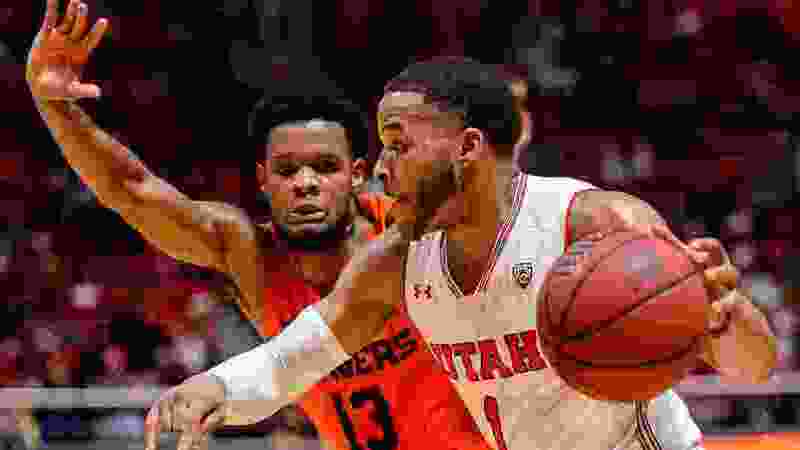 Jones shot 35.2 percent from the field for Utah, failing to show the long-range ability the Utes will need in the absence of Barefield and Van Dyke. The coaching staff is in the market for a shooter who can help immediately. The Utes have received a commitment from Brandon Haddock, a 6-foot-2 guard from Carroll High School in Southlake, Texas. Tajzmel Sherman, a guard from Collin College in Texas, visited Utah last week and is expected to make his choice after a trip to West Virginia in mid-April. The Utes will return part-time starting guard Both Gach in 2019-20. Naseem Gaskin will be a freshman after redshirting and Olympus High School’s Rylan Jones also will join the guard rotation. Utah coach Larry Krystkowiak often praised Charles Jones’ effort, but usually in the context of his needing to learn more defensive concepts to stay on the court. Jones appeared in 27 of the Utes’ 31 games for an average of 11.6 minutes. Will receiver Steve Smith Sr. become the second Ute in the Pro Football Hall of Fame? ‘God willing,’ he says. He started two games in November and scored 12 points in a rout of Mississippi Valley State, but didn’t have a consistent role in the rotation in Pac-12 play. Jones did score 11 points against Washington State at home January and hit a key 3-pointer to stem a WSU rally in a road win in late February, when Timmy Allen’s injury altered Utah’s playing rotation. Jones later played a total of six minutes in wins over USC and UCLA to close the regular season and didn’t get off the bench in a loss to Oregon in the quarterfinals of the Pac-12 tournament.